Clean serface for application. 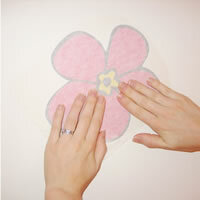 Be sure to remove any major bumps or indentions that would affect the decal appearance. Carefully cut around each decal leaving some white area at the edges. 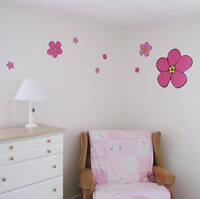 Next use masking tape to begin arranging your decals around the wall. This is an important step that will give you a better idea of your space and design. Once you have decided where each decal should go-- next, begin peeling the back side (without the printing). Do not peel the front side at this time. 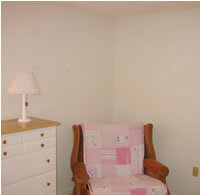 Then apply the decal back to the wall. 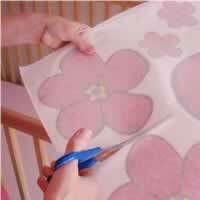 Using just your fingers-- begin in the middle of the decal and slowly smooth out the decal --moving towards the outward edges. Apply enough pressure so the decal adheres to the wall. If there are any bubbles it is still safe to peel up part of the decal and smooth it out again. Next, slowly and carefully peel off the top sheet. If the decal starts to peel off the wall-- stop and carefully pull from another side of the decal. Continue peeling carefully until the sheet is completely removed. 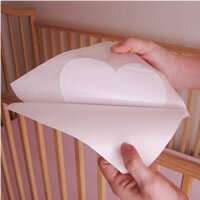 Tip: pull the cover sheet parallel and close to the wall -- not directly out from the wall. Finished! If you need to change the placement of a decal-- you can at this point. However, after a couple hours it is not recommended to peel off (as the integrity of the decal may be lost).